"When the report got out I was hoping you would come so we could show the city what we're doing now and things that we've done to make it better." The surprises from Rollin' Smoke Owner Dusty Ardoin didn't end there. "I appreciate what you do," he said to Chief Investigator Darcy Spears. "That's gonna help me maintain a safe environment, so thank you." Talk about owning up to one's mistakes! There's no better reception for an episode of Dirty Dining. "Obviously you know what happened," said Spears. "There was a cockroach infestation that caused an imminent health hazard closure on September 5. How did all that go down?" "Well," Ardoin answered, "the Health Department said that they had a complaint and so they did and saw one in the back, not in the kitchen, not anywhere we make food there was not one ,but it doesn't matter because it's a serious situation." Rollin' Smoke BBQ on South Highland Drive got their A grade back on September 7 -- two days after the Health District shut them down. The inspector found multi-generational roaches throughout the storage area, as well as on a soiled cloth on the floor near the walk-in cooler and next to the sink. "It's gonna happen so you really have to pay attention," Ardoin said. There were also multiple flies in the kitchen, greasy equipment and dirt and food debris on floors. "What kind of a deep cleaning did you do to get rid of that?" Spears asked. "Well, I was 48 hours round the clock for two days that I was closed. Around the clock of crews and crews and crews of deep, deep, deep cleaning--deeper cleaning than I've ever done in my entire life." Dusty invited us into the kitchen to show us the results of all that cleaning as well as lots of new caulking to prevent pests from getting in. "It was very catastrophic. We take a lot of pride in what we do and it definitely made me cry and definitely opened up our eyes." 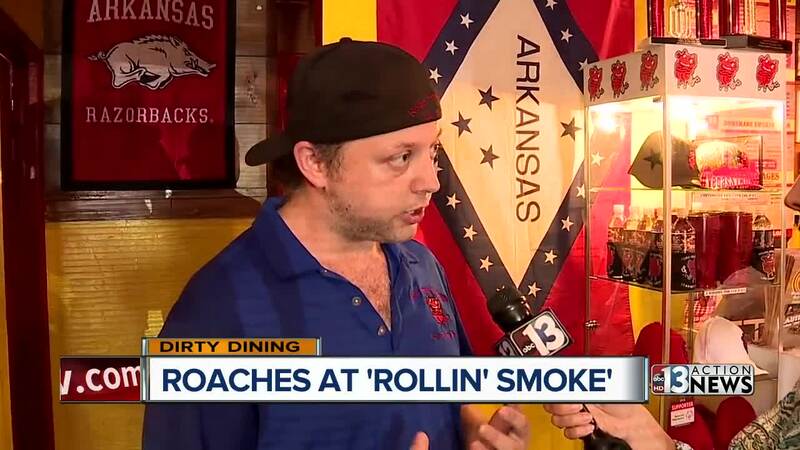 Rollin' Smoke was one of four restaurants shut down for cockroach infestations over a two-day period. Roaches were a repeat violation for Chicken Now at the Outlet Center on Las Vegas Boulevard and Warm Springs. It was shut down September 5 but re-opened the next day with a 6-demerit A. Inspectors saw improper handwashing after handling raw chicken, found mashed potatoes from the day before at an unsafe temperature and found them using vinegar as a sanitizer. Plus, the ice machine, walls and cook line shelves were all dirty. Our call to Chicken Now asking for comment was not returned. Multi-generational roaches also caused a closure at La Pupusa Loka on Charleston near Eastern. They were shut down September 6 when they also failed re-inspection from a previous downgrade with repeat critical and major violations. There were multiple foods left unattended on the prep table in the temperature danger zone, expired beans in the fridge and a heavily rusted food processor blade. La Pupusa Loka reopened September 12 with a zero-demerit A grade. We were unable to reach anyone there for comment. The main kitchen at the California Hotel and Casino on Ogden and Main was yet another closure for multi-generational roaches. There inspectors found cockroach feces on outlets and roaches on the prep table as well as many other locations throughout the kitchen. Meat tenderizers stored as clean had old food debris on them. Food debris and grease was also accumulating on the floor and under equipment. It reopened September 10 with a zero-demerit A grade. A corporate spokesman for Boyd Gaming sent the following statement: "The safety and health of our customers and team members is our highest priority, and we are working closely with the Southern Nevada Health District to address and resolve this issue. Rest assured that we are on top of this matter, and we are confident we will successfully and permanently resolve it in the very near future." Our two other imminent health hazards were for no hot water. The Hangover Bar at Madame Tussaud's in the Venetian was shut down September 6. In addition to the hot water issue, inspectors found an excessively dirty mop sink and slime on a soda nozzle. The bar reopened the next day with a zero-demerit A. Management there disagreed with the closure, saying they did have hot water in the bar, just not at the one handsink which was brand new and had a malfunctioning piece. 7-Eleven on Koval and Flamingo had its deli area shut down September 5 for no hot water. It had been operating that way for as long as 24 hours. There was also food debris build-up on the bottom of the freezer and heavy slime and debris in floor drains, plus, a can of beer in the hand sink. It reopened the next day with a zero-demerit A. The manager said they have no comment on the closure. There were also several high-demerit restaurants in our current batch of inspections. Fiddlestix in the Gold Spike on Las Vegas Boulevard and Ogden got a 39-demerit C grade on September 5. There were multiple expired foods including week-old sloppy joes, three week-old Bang Bang sauce, macaroni salad that was nine days past its use-by date and moldy blueberries. Inspectors also found undercooked chicken and excessive dirt, debris and grease on equipment and floors. They had to throw out sausage, ham, tomatoes, cheese, steak and eggs due to unsafe temperatures. There was excessive old food debris on the deli slicer blade, a repeat violation for food not labeled with a proper use-by date and the ceiling was filthy. Fiddlestix was back to a zero-demerit A on September 14. Downtown Project Food and Beverage Manager Dan Adams said they have no excuse for dropping the ball on safety and sanitation and they view the health inspection as a report card. Frank and Fina's Cocina on Grand Canyon and Flamingo also got a 39-demerit C grade on September 4. They have not been reinspected yet because they're waiting on some equipment repairs. Inspectors found a dirty wiping cloth being used to wrap tortillas on the prep table. Raw chicken and raw beef were thawing at room temperature in the same three-compartment sink. Rice, cooked chicken and cut tomatoes were at unsafe temperatures. There were personal drinks and a bag of cookies on the prep table. Avocados were cut without being washed first. Shrimp was thawing at room temperature on top of a box. And the person in charge was not able to demonstrate food safety knowledge. There was also lots of food debris and grease build up including stalactites of grease hanging on the grill. The owner's daughter told Darcy Spears that they're devastated by the C grade. She says they take pride in being a mom and pop restaurant, family-owned and operated, and that they've been short-handed due to financial struggles as they try to save their business. She worries this could be the last straw for them. She added that the inspection took place on the chef/kitchen manager's day off. Sol Tapatio on Maryland Parkway near Katie got a 40-demerit C grade on September 4. It was back to a 3-demerit A on September 10. Inspectors found excessive food debris and build-up as well as an excessive amount of dead roaches, casings and droppings throughout the back dry food storage area. Glue traps were entirely filled with dead roaches. A food handler used bare hands on ready-to-eat tortillas, utensils were stored in lukewarm standing water and food was stored uncovered in the fridge and freezer. Raw eggs were stored above open containers of raw onions and ready-to-eat ham. Open pans of food were stored on the floor in the freezer. Multiple open containers of employee medications were stored over food equipment and the prep sink and containers of bleach were co-mingled with open food. There was an open crock pot for customer self-service subject to consumer contamination and brown slime on soda nozzles. Glass soda bottles were reused to store cooking oil and there was heavy old, dried food debris and build-up on multiple in-use kitchenwares. Multiple containers of food were thawing at room temperature and old cardboard boxes were reused to store open food. Despite multiple calls to Sol Tapatio, no one ever answered the phone. The highest demerits went to Anthony's Trattoria on Nevada Highway in Boulder City. It was shut down with 49 demerits on September 4 and back to a 3-demerit A on September 10. The closure was due to excessive demerits and the imminent health hazard of gross, unsanitary conditions. The kitchen looked like it had been hit by a cyclone. There were flies landing on cutting boards, utensils and food equipment and a dead fly on the cutting board of the cook line prep table. Excess old food debris contaminated refrigerator units and floors, walls and ceilings were dirty with dust and grease. There was also water leaking from the ice machine and flooding the dish area and lots of equipment in disrepair. A bread station and salad station had been set up near the employee restroom and multiple food handlers were using bare hands on ready to eat lettuce and customer ice. Cooked mushrooms had mold on them, lots of food was at unsafe temperatures and raw beef was stored over bags of lettuce and cooked lasagna while raw shrimp and raw sausage were stored over cooked potatoes. Chemical spray bottles and employee drinks were stored on cutting boards and there was black build-up on the dish rack. The owner did not return the message we left on his cell phone asking for comment.